Lisa E Design Blog: Happy 4th! Happy Independence Day! Here's a card I did to put in the next Operation Write Home box. It's been awhile since I made Any Hero cards. These are notes, thank yous for our service men and women to let them know how much their sacrifice is appreciated. The stars were cut with the Cricut using SCAL software. I created the file myself by just adding one of the built-in images for a star over and over again. I sized some differently, put some stars inside others to get the cut-out ones, and pushed them close together then welded the whole thing. Most of it cut out as one shape and I was suprised and how quickly it cut. I glued all this down with spray adhesive (3M Photomount, I think) - a tip from over at Two Peas. Soon it will be time to get our cheeseburgers ready along with some locally grown corn-on-the-cob. Enjoy your celebrations! Ingredients: Cardstock: Real Red by SU! DSP: Night of Navy by SU! 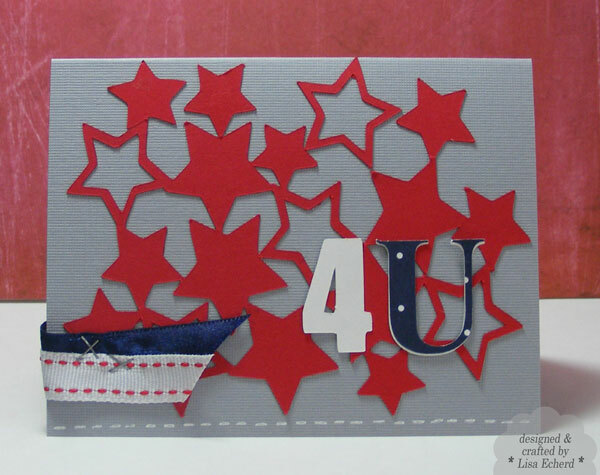 Ribbon: Navy from craft store; Red and white from SU!